Well. Where do I start with this? City 5-0 Liverpool. Take a good, long look at that. After three years of frustrating draws and dismal defeats, our recent Liverpool jinx is most definitely over. I’d say that’s revenge, well and truly exacted. A sensational game packed with free-flowing football, chances, goals and controversy, I’ll try not to get too carried away as I run through some things that we can take from today’s masterclass – but I can’t promise anything. It’s a day to savour Blues. Drink it in. Hallelujah. After a year of goalkeeping horror, we could finally have someone we can trust between the sticks – that’s if the studs of Sadio Mané haven’t left too much of a mark. Commanding, confident and composed, the Brazilian was fantastic in protecting a goal left somewhat exposed in the opening 30 minutes, most notably when producing a fine save to deny Mohamed Salah. The Egyptian, bearing down on goal, opened his body to slide the ball into the far left-hand corner, but the keeper read his intentions and got down quickly to spring across and parry it away. Apart from that, he protected his near post well on many occasions, as well as instinctively pouncing from his six-yard box to cut out the low crosses that were being fizzed in from either side. His main contribution to the game however, was, strangely enough, taking a boot to the face. Another ball over the top from the visitors meant that Sadio Mané was bearing down on goal with his usual, searing pace. Ederson, typical of his positive and pro-active performance, rushed out in attempt to clear the ball with his head before the Senegalese winger could reach it, but, in doing so, collided disastrously with a high-flying boot. Mané was red-carded and Ederson sickeningly floored, but, in denying an almost certain goal and drawing a red-card foul, he won us the game there and then. Despite an unceremonious end, Ederson produced 37 minutes of goalkeeping that will have endeared him to many. Sticking to the theme of five for today, I have some statistics about Aguero and Jesus. In the last five games, Aguero has five goals, Jesus has five goals, and between them, the pair have, you guessed it, five assists. Today, they were mesmerising. Relentless pressing, slick link-up play and lethal finishing, the pair staked their claims, both individually and collectively, to Pep Guardiola. Start them together, and they’ll score. Aguero’s finish was typically cool. After being slipped through by Kevin De Bruyne, the Argentine skipped past the grounded Simon Mignolet before rolling the ball into an empty net to give City the lead. Hats tipped to the highest non-European goal-scorer in Premier League history. He might be 113 goals behind Aguero’s record-breaking tally, but a fresh-faced Gabriel Jesus planted a powerful close-range header past the despairing Mignolet with a similarly predatory instinct to his legendary strike partner. However, it was Jesus’ second and City’s third that provided the most encouraging and perhaps most symbolic moment of the game. Bearing down on goal, Aguero looked certain to lash the ball into the corner for his second. Instead, he tapped the ball, incredibly unselfishly, towards Jesus, who finished into an open net with aplomb. The pair celebrated joyously together, a clear and unmistakable sign that the two can, and will, play together and produce magical attacking football. Pace, power and positivity, I’m a huge fan of both Kyle Walker and Benjamin Mendy. Their enthusiasm and energy is infectious, steaming forward at every opportunity and getting stuck in at the back. As well as a clean sheet, they each picked up an assist today – truly representative of their equally impressive displays. 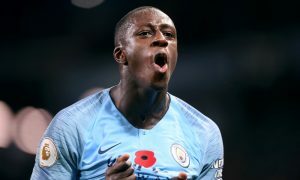 Not to bring any sort of preference into this, but Benjamin Mendy is fast becoming one of my favourite players at the club. A real character, as shown through his hilarious social media antics and reinforced today when he threw some shapes towards the South Stand after the final whistle, the French full-back has real potential to become a cult-hero at City. Despite leaving Otamendi exposed with some questionable attack-minded positioning in the first half, which will no doubt have to be worked on, his attacking play, most significantly his crosses, were fantastically dangerous. 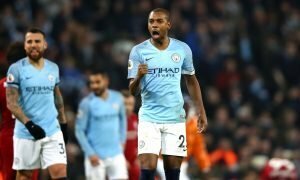 Not only did he provide an assist for Sané after wonderful one touch football, but he supplied a teasing cross for Walker in the first half, a delivery that led to an Aguero disallowed goal in the second and a zipped ball that deflected off Matip and nearly ended up in the Liverpool net. I can see many more goals from the left-hand side in the future. Now, that annoying, opinion-splitting question remains. It was three today, but how many centre-backs do we play to make sure we get the best out of our two speedy full-backs? A frustrating consequence of playing three at the back with two full-backs is the need to leave out so much attacking talent. 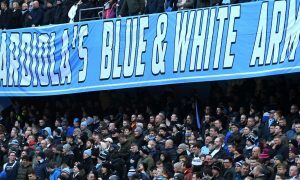 Such was the case today, with Leroy Sané and Bernardo Silva having to settle for a place on the bench – and not forgetting the suspended Raheem Sterling, who probably would’ve joined them. But I would argue that, despite the sympathy we feel for these players, who have seemingly done nothing wrong, it’s a fantastic situation that Pep has created, and will exploit. Today was a perfect example, as Leroy Sané, evidently fired up, ambled onto the pitch and produced some of his best moments in a City shirt. His first goal, as mentioned before, involved a fantastic one-two with Mendy before a precise finish into the near corner. His second was something, in all honesty, I would’ve never expected from the young man; a stunning, curled effort from 25 yards out that sailed straight into the top corner. With a point to prove, it’s clear that Sané wanted to impress Pep – and that’s exactly what he did. A place in this City squad is very rarely safe. Complacency will not be accepted, only 100% effort will. So instead, I’ll just reel them off one by one. A bit of food for thought. Kevin De Bruyne can never be written off – he is a big game player. John Stones proved that he can defend very capably, as well as step into the midfield with assurance and confidence. Otamendi, despite his evident ability, looked very uncomfortable when up against the pure pace of Salah. Danilo’s versatility will be crucial as the season goes on. Yaya Touré, Gundogan and Bernardo Silva will have to prove themselves to Pep if they want their place back. So many positives. So many reasons to be happy. Feyenoord up next on Wednesday. Bring it on.